I am writing to you today from Butterfly Town, U.S.A., (a.k.a. 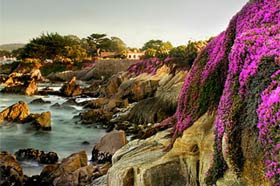 Pacific Grove, CA) which has to be one of the most beautiful spots on all of the West Coast. And that's saying something. Bordered by the city and bay of Monterey, the Del Monte Forest, and the Pacific Ocean, Pacific Grove sits 150 feet above the sea like a glimmering jewel. Hey, did you know they have more Victorian homes here per capita than any other place in the U.S.? Yep, they've got more gables, turrets, wraparound porches, and gingerbread trim here than you can shake a stick at. You know that expression, "they don't build 'em like they used to?" Well, they never say that here. And if you somehow tire of its nature, art, fine food, historic homes, museums, or just sheer physical beauty, Pacific Grove puts you minutes away from the famed Pebble Beach and the Monterey Peninsula to the north, and Carmel-by-the-Sea and Big Sur to the south. But you can't talk about Pacific Grove without talking about the butterflies. Migrating monarch butterflies make an annual mating stop in Pacific Grove from October to February each year. We're talking tens of thousands of them, folks. Like a shriners convention for insects. These little buggers fly from Canada to Pacific Grove each fall, traveling over 2000 miles in the process. I wonder if they log reward miles? Anyway, here's the thing, not one of the butterflies has ever made the trip before. In fact, a monarch butterfly's life span is so short that a bunch of them were born along the way, and still manage to figure out how to get here. I had a Rand McNally and a GPS and still got myself turned around on they way up from Frisco. And did you know there's a $1000 fine for even threatening a monarch butterfly here? Are you kidding me?! You gotta love California. Anyway, I am staying at the Pine Acres Lodge which is about two blocks from the ocean, and walkable to everything in town. It's a low-key, family friendly place with a rustic motif. I've got a cozy one bedroom with a queen bed and sleeper sofa, and a small deck from which I can see the ocean and have a BBQ. Looks like you can rent one on RedWeek.com in October (start of butterfly season) for $100/night. Our owners love this place, rating it 4 stars, but resales do come up from time to time. We've got two right now for $1500/ea. Seems like a deal, but I am completely biased towards anything Pacific Grove right now. Maybe sign up for a posting alert at this resort, and be notified when new units are added for rent or sale. Well, I'm going to go dust off my golf clubs and hack my way through eighteen. They say there are seven golf courses within a ten mile radius of this place. With the way I play, that's about six too many, but who cares when your in Butterfly Town?